The best-selling astronomy education resource available just got better! 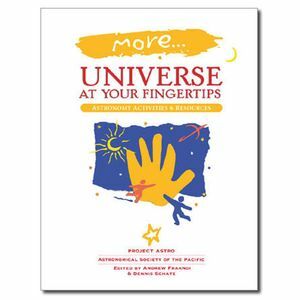 The thousands of educators and astronomers who own the original Universe at Your Fingertips have asked us for more! Here are 25 new classroom-tested activities, a host of resource listings and teaching suggestions, plus a guide to reliable astronomy information and activities on the web. Activities include Measuring the Hubble Deep Field, Organizing the Galaxies, Sorting Saturn's Moons, Making a Mapping a Volcano, and many more! An indispensible supplement to the first notebook and a stand-alone guide to the most up-to-date astronomy education resources. Click here to view the Table of Contents for More Universe at Your Fingertips. This product is also available in Spanish. 180 sheets, 3-hole punched. Edited by Andrew Fraknoi and Dennis Schatz. For all grades.